World Wars Always Begin With Trades Wars: Pike was right! Given that the Global Economic & Financial System has yet to recover from the 2008 market crash(es) and subsequent Second Great Depression, Trump’s provocative measures can only be seen as sheer protectionism. The Federal Reserve could no longer continue to create money out of thin air via quantitative easing. The $21 trillion dollar plus national debt is currently unsustainable and the whole world knows it thereby undermining precious faith in the once Almighty Dollar. Back in 2015 when Greece defaulted on its sovereign debt multiple times, many wondered if that crisis would mark the beginning of the end of the European Union. Everything pointed to Greece being the Achilles’ heel of the Eurozone, as well as the downfall of the Euro. At that time, Greek total sovereign debt was just big enough to cause a HUGE problem for the troika— the European Commission, European Central Bank (ECB) and International Monetary Fund (IMF). The crisis was also giving agita to the German and French bankers who held a LOT of Greek paper. Nevertheless, the top decision-makers at the EU knew that Greece could not be allowed to fail as it would set a very dangerous precedent and maybe lead to a much larger systemic crisis Europe-wide. Now fast forward to 2018. It was always Italy that would be the next major economy to fail should a genuine Greece bankruptcy be allowed to occur. Given the size of the Italian economy (4th largest in the EU), should a contagion of failures take place, the financial burden on the European Union would be unsustainable. Such an eventuality would surely augur the final end of the Euro. Even though the Greek situation appears to be fixed, it’s not. It’s actually worse than ever, but carefully covered up so as to prevent a contagion of defaults across the southern swath of Europe. The Italians do posses a sheer genius for papering over the most dismal and perilous financial predicaments. That comes with having run a couple of Empires for 1500 plus years. However, sooner or later there comes a time to pay the piper. The Italians have kicked their can down the road to the point where there is no more road, only a cliff. They are now staring into the abyss below with no more wiggle room. This most recent sovereign debt crisis clearly indicates that this one is substantially different than all the previous ones. However, it’s the current unruly state of Italian politics (When is it not unruly in Rome?) that will likely deliver the death blow to their tumultuous relationship with the EU. The profound shift in Italy’s political environment today is every bit as earthshaking as the UK’s Brexit and the USA’s Trump movement. Justifiably the Italians are very unhappy with the way the German banksters have handled the whole Euro fiasco from the start. Like the Greeks, the Italians have been around for a very long time. They knew the EU project was a total fraud from the very beginning. They also knew they had no way of resisting it, as they would have been frozen out of the Eurozone markets. But when the capital of your country (aka Rome) has been around for over 28 centuries, you acquire some wisdom about the rise and fall of … everything! This is precisely what the Italians decided to do: let the EU implode under the weight of its own mismanagement and inefficiency, corruption and criminality, and especially its institutional ignorance and arrogance (See article below). Welcome to the Summer of 2018! There’s no question that the summer of 2018 will bring interesting times to the Global Economic & Financial System, and especially to the EU’s finances. With President Donald Trump tearing up the planetary landscape wherever he goes, the degree of uncertainty has never been higher. In his stated determination to get the United States a better deal on everything, all the international trade deals are under serious scrutiny and reconsideration. NAFTA, TPP, TTIP each have their serious problems and Trump intends to fix them for the benefit of Americans ONLY. This will make each of them effectively null and void with no real alternative for any of the participants to go to. More significantly, the main parties will never agree to losing out on anything in a future agreement(s). Trump & Company have also eviscerated the WTO (World Trade Organization). The WTO was always a de facto enforcement agency for the British American Empire, but Trump has taken its coercive powers to new levels of economic oppression and financial tyranny. Any competitor is simply brought before the WTO Dispute Settlement Board…after they have been unlawfully sanctioned or made the object of some other unwarranted persecution by the U.S.
What does all of this have to do with Italy? The atmosphere worldwide is getting very thick and tempestuous. The people of Italy have had enough of EU tyranny. They know that the German banksters have set up a totalitarian rule by money. With Trump visibly throwing his weight around, the Italians ,too, have been empowered to take back their country from the Rothschild banking cartel. The political climate in Italy particularly reflects the unshakable resolve of the entire nation to put the power back in the hands of the people. The recent election outcomes have demonstrated that there’s no looking back this time, no matter what the consequences. Italians have learned many times over what it’s like to be ruled by a dictatorship and the EU cuts that profile exactly. The Eurocrats in Brussels really function like an autocracy, and the Italians can smell an autocrat 20 countries away, especially one like Jean-Claude Juncker the Luxembourgish politician presently serving as President of the European Commission. Then there is Chancellor Angela Merkel, the current dictator of the Federal Republic of Germany . That’s one piece of work who the Italians blame their overwhelming refugee crisis on. It was Frau Merkel who invited every economic immigrant and war refugee from the Mideast and Northern Africa to come to Europe for a job… and a home… and a whole lot of government benefits that even the destitute citizens don’t receive. However, it’s really the unique financial inter-relationship between Italy and Germany that has reached a precarious climax. The short story is that whenever there is a capital flight from Italy, as there has been because of the extremely volatile political situation there, Germany is usually the destination. The following article breaks down this financial dynamic quite well. 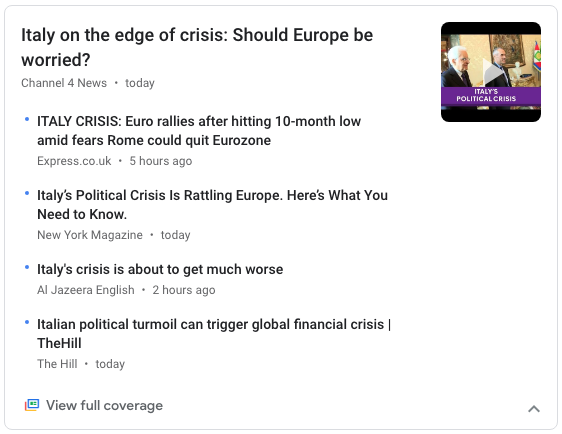 This ever-intensifying crisis in Italy started the very day that the country became a founding member of the European Economic Community in 1957. The government(s) and banks in Italy have cooked the books practically forever, so it was only a matter of time before this predicament finally caught up with them. When the European Union became official, the Italian institutions were subjected to a new regime of external accountability which they have never before had to suffer. The bottom line is that there is no more strict a taskmaster than the German banksters. They demand an accounting for every Italian Euro as well as Lira still in circulation. Herein lies a big part of the problem. Italians, perhaps more than any other country on Earth, have an inherited aversion to paying taxes. Hence, all the mom and pop enterprises do their business under the table whenever they can. The corporations have to play by the rules, of course, but even they utilize some very creative accounting practices in order to avoid making tax payments. Nonetheless, it’s as though the national pastime is tax evasion 24/7. With this critical understanding, it ought to be easy to see the various problems which can and do develop over the long haul. Greece also has an extremely well-developed underground economy. They created black markets out of sheer necessity (read: survival) during the worst period of their ongoing debt crisis. However, it’s the Italians who have mastered the art of the barter economy since they have so much to offer each other across their diverse economic sectors. The bottom line here is that the Italians are hip to all the ways that the EU lords it over the citizenry of each nation on the continent. 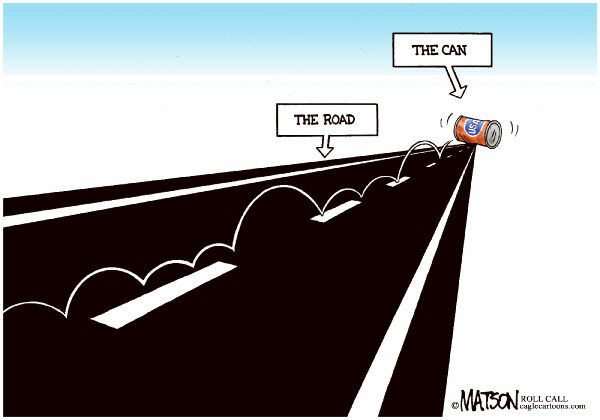 It’s always Brussels’ way or the highway and the Italians don’t like driving on the German Autobahn. Clearly, they have had enough of governance by diktat from what is essentially a despotic communist superstate. The next article proclaims how only direct and immediate intervention by the ECB can solve this dilemma, IF IT CAN. Mario Draghi, an Italian economist, is the sitting President of the European Central Bank and is the only one in the room who might be able to alleviate it. 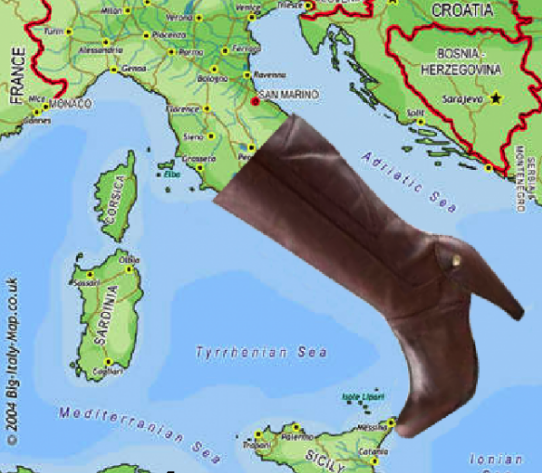 Being an Italian, Draghi knows in his bones that this storm must pass over Italy sooner or later. Trader Warns “Only Draghi Can Save Us Now”… But Will He? This situation in Italy is getting very serious indeed. And because of its crucial role on the EU stage, the world can expect a lot of Italian drama this summer. Because of the various forces at work — some of them seemingly uncontrollable, others quite unpredictable — there’s a perfect storm gathering over the Italian peninsula. It’s as though a conspiracy of multifarious circumstances was purposefully set up and then put into motion so that the resulting Superstorm will literally take apart the EU superstate. The European Union project was perhaps the worst idea ever to emerge from the Continent as it was stealthily implemented by globalists who want to rule the world. Their immediate goal was to more easily manipulate an entire continent to carry out their orders, especially those concerning declared wars and other armed conflicts. The following headline graphically describes the current state of affairs in Italy, and things have not even really gotten that bad yet. If the job of collapsing the EU superstate was to fall to any member nation, it was Italy. They know well that empires don’t last, and that when they fall, many people suffer terribly. Perhaps they have been planning a controlled demolition all along. Let’s hope so, but knowing the Italians they’re probably doing this one on the fly. It is against this rapidly changing backdrop throughout the EU and world-at-large, that agents of the New World Order are moving the nations toward war. It’s entirely true that all the major wars of the modern era were deliberately engineered by the international banking cartel (who are themselves completely controlled by higher, unseen powers). They possess the tools and techniques to initiate trade wars. The banksters also exerted the necessary power and influence to foist economic sanction regimes (unlawful, of course) on powerless countries. The Rothschild crime syndicate has resorted to this type of economic sabotage and financial terrorism for centuries. Their agents now populate the highest echelons of the Trump administration on both sides of the house. Trump’s Council of Economic Advisors and Neocon Zionist warmongers are now working overtime to create an international environment that is, at once, unpredictably dynamic, rife with apprehension, and full of mutual suspicion between nations. 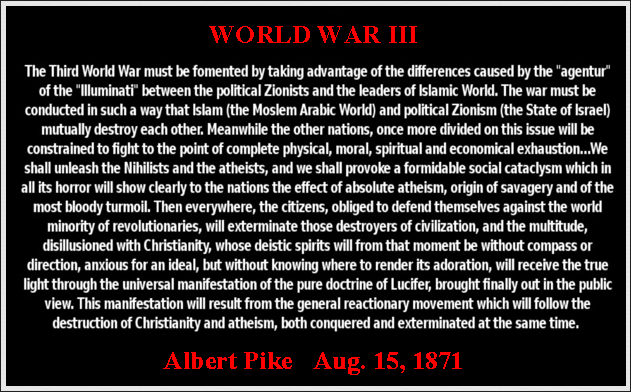 It is within this highly volatile context that the globalists intend to incite the hot phase of their long-planned World War III (See graphic at the top of this post). They know the jig is up on their multi-millennial Pyramid-Ponzi scheme, and that there is really no other way out for them. Therefore, during the remaining years of this decade, relations among nations will become extremely combustible by design. The very same perps (Illuminati banking families belonging to the Black Nobility) used this same playbook prior to both World War I and II. They know that aggressive trades wars are quite effective in fabricating a conducive atmosphere for armed conflicts. They know that a man without a job can be easily conscripted to fight in a foreign land as a mercenary soldier. There is a HUGE difference between the prevailing circumstances of 2018 and those of 1914 and 1939. The Information Age has seen a complete transformation of the entire planetary civilization. Because of the Internet and the emerging reality of a digitally connect global population, everything has changed. What the NWO globalists could once do in secret is now happening in broad daylight. In some cases, the Alt Media is able to avert their nefarious schemes before they even execute them. In those instances where they proceed anyway, their plots are exposed for all to see. Now that We the People know what the perps have in store for humanity, we can work together to foil their plans, once and for all. How do we do that? By revealing their ill-fated conspiracies before they can commence with them. Modern-day prophet Edgar Cayce accurately pointed out the “national character flaws” of each of the most powerful nations on Earth. For Italy, he identified “Dissensions” as their main issue. That Italy has had more governments than any other country since World War II is a testament to this reality. What the EU leadership likely failed to understand is that Italy’s dissensions would eventually become the European Union’s problems. And so they have…in 2018—the year of tremendously interesting times!